Animation has managed to anthropomorphise a wide variety of creatures, from coyotes to frogs, Tasmanian Devils to woodpeckers. It has managed to make mice and even rats cute, but Jiminy Cricket notwithstanding, animation remains squeamish about insects. The most famous examples tend to have negative connotations: the malign preening in How a Mosquito Operates (Winsor McCay, 1912); the Kafkaesque love triangle of Miest kinooperatora (The Revenge of the Kinematograph Cameraman) (Ladislaw Starewicz, 1911); the obnoxious gambling bug in Warner Bros’ Early to Bet (Robert McKimson, 1951); the allegorical victim of Stalinism in A Légy (The Fly) (Ferenc Rofusz, 1980). Like the latter, Mothlight visualises a “day in the life” of an insect from birth to death; however, it summons some of the more positive associations of lepidoptera, such as creativity and the soul (1). You could say Brakhage puts the “anima” back into animation, reanimating the dead, painstakingly affixing the remains of dead insects, leaves and the like onto the film strip, and feeding it through the projector back to life. 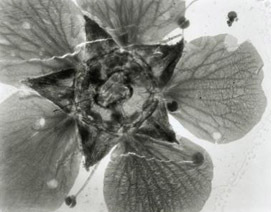 Of course, the principle of film projection is the illusion of life through light, with the audience gathering to watch like moths attracted to a lamp: the beauty of Mothlight is the way Brakhage evokes the moth not through cartoon mimicry, but by the fragile sensation of its movement, batting against the screen, hurtling in descent. The effect is exhilarating and terrifying. Brakhage might be accused of playing God (or Dr Frankenstein), and it is no coincidence that Mothlight was assembled during the long production of his creationist epic Dog Star Man (1961–4). In contrast to that film’s decasiac, kino-eye collage-montage, Mothlight, like Sokurov’s Russian Ark (2002), is a one-take aria, a breath of life that ends with its subject’s death. Its making is also a dismantling – imagine celluloid flypaper – and its examination of life’s remains looks forward to The Act of Seeing with One’s Own Eyes (1971). Mothlight acknowledges the limitations of the screen, the way film traps subject matter in a box, suffocating the life out of it. See Ronald A. Gagliardi, “Lepidopteral Symbology: Lepidoptera Symbols Relating to Flight”, accessed June 2004.